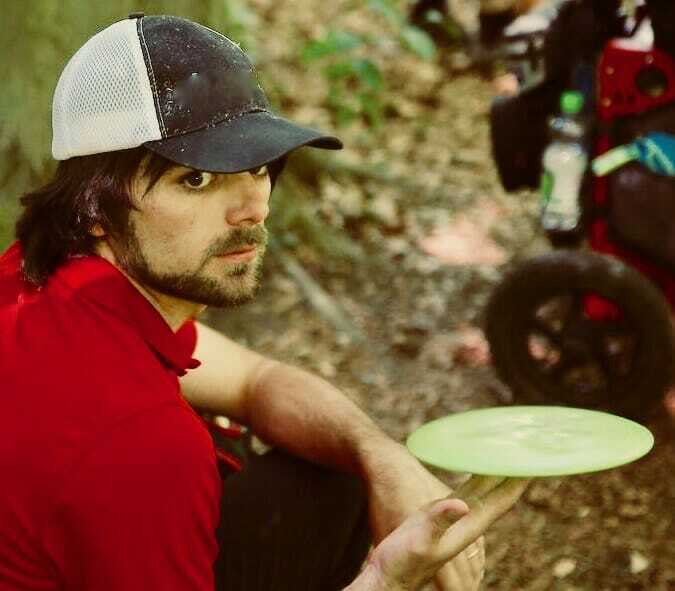 A playoff: two people head-to-head at a time when each little bit of good fortune or bad luck (like, say, your disc landing on the back of a chipmunk) can mean everything, and excitement and tension filled the air in a palpable haze. What more could disc golf fans ask for? 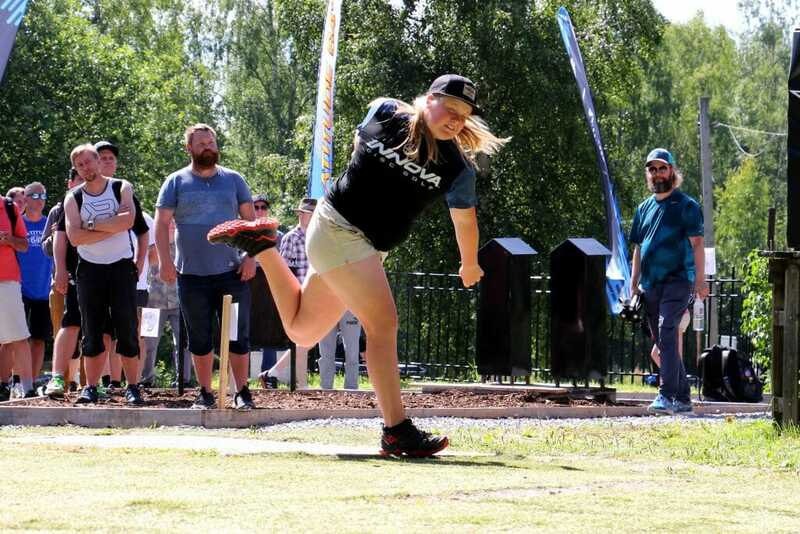 Well, the Open Women at Sweden’s Skellefteå Open, the third EuroProTour event in the series, helped us find out by providing not just a head-to-head battle, but a head-to-head-to-head-to-head one between Finn Eveliina Salonen, Estonian Kristin Tattar, and U.S. natives Catrina Allen and Paige Pierce. They had all finished out the three-round event with 8-over par 197s. In the playoff, it was Salonen who emerged from the pack victorious while the others had to struggle to fit above the “2” on the podium. Of the four women in the playoff, the only player who had far to travel to reach the top in round three was Pierce. 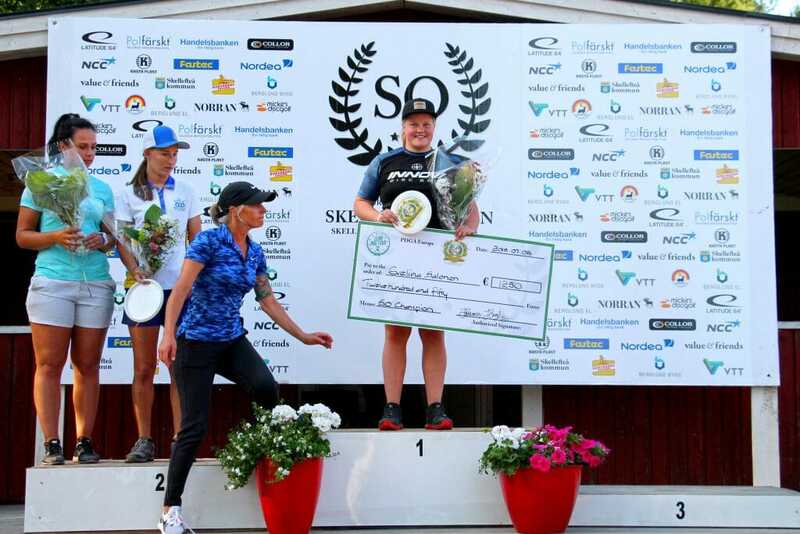 As the final round began, Allen, Tattar, and Swede Sofie Björlycke were tied in first with 7-over par 133s, and Salonen was just one stroke back at 8-over par 134. Pierce’s 11-over par 137 had tied with Finn Henna Blomroos in fifth. Going into the final round, Salonen and Tattar had slightly different philosophies. Salonen was systematic, saying the night before round three, “it is only one stroke, so tomorrow I want to play a safe and solid game. Every hole is important. I had double and triple bogeys yesterday, so tomorrow I don’t want to take big numbers.” Salonen did take one double bogey during the final round, but that was an improvement over the two doubles and a triple from round two. For anyone watching the Open Women Metrix live scoring, however, the end of round three would have seemed like anything but zen. As Allen, Salonen, and Tattar approached their last hole (Björlycke was also on the card but out of contention for first), Pierce sat in the clubhouse having shot the hottest round of any player in the field—a 998-rated 3-under par 60. The resurgent round had moved Pierce from 11-over par to 8-over par. To that point, Allen was par on her round and was at a 7-over par total while both Tattar and Salonen were 8-over par. Allen needed just a par on the 97-meter (318-foot) par 3 18th to take home a fifth-straight win. Unfortunately for Allen—and fortunately for the three others in contention—she turned in a bogey on the hole while her card-mates parred, necessitating the epic playoff that followed. While onlookers could have mistaken the four women approaching hole 1 as a full flight starting out on another round (Weird, they may have thought, I thought there were just three rounds), it was a round destined to last just three holes. Tattar and Pierce found themselves knocked out after failing to match Allen and Salonen’s pars on the signature par 6—no mistake on that number—350-meter (1,148-foot) starting hole. Tattar simply had trouble finding the fairway while Pierce actually had a chance to lock down the win with a Circle 2 putt for birdie, but missed that as well as her Circle 1 come-backer. Hole 2 was an island, and both Allen and Salonen failed to reach it. Not content with the already high level of tension, however, Salonen’s drop zone effort hit the front of the cage while Allen’s hit just a little too left in the chains to be able to stay in. The next hole was the decisive one. Allen missed a Circle 1 chance at par to put some pressure on Salonen’s birdie putt on the par 4 3rd. But it wouldn’t have mattered, Salonen drained the birdie and clinched the victory. The significance of the win shouldn’t be overlooked. Salonen taking first here makes two European tournaments in a row where Pierce has finished below European players (she finished in third behind Tattar at last week’s Tyyni). Also, despite taking second, Allen again played strongly, continuing her turn-around from early-season woes. 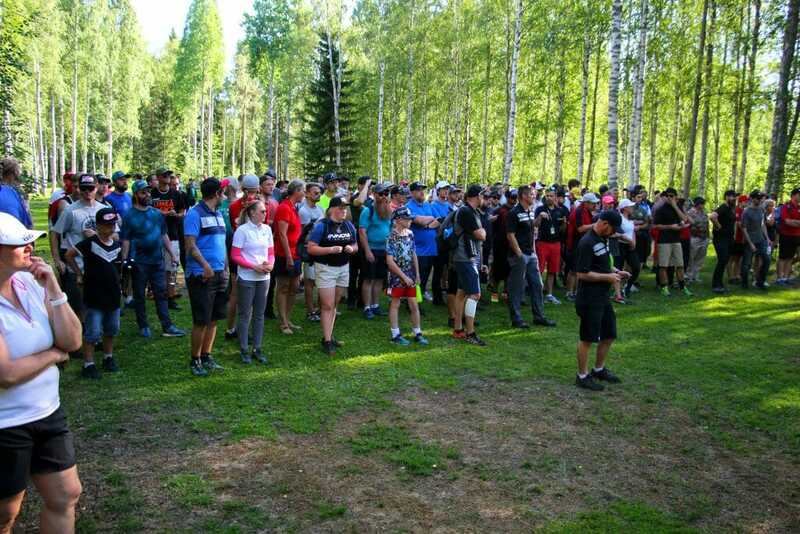 Perhaps most importantly, Salonen and Tattar display the growing strength of female European disc golfers and their play here (as well as Tattar’s last week) should make people—and media sources like Ultiworld Disc Golf—reconsider the often U.S.-player-dominated discussion of who the best female disc golfers in the world are. That said, Salonen and Tattar—along with other top female European players—will have another chance to show off their prowess again in this week’s Konopiště Open. With Pierce not registered for the event, Allen will be the sole U.S. representative there. You can relive the playoff here courtesy of a Facebook live feed posted by Juha Kÿto. Comments on "Salonen Wins In 4-Way Playoff At Skellefteå Open"